Gilchrist, Connie (Countess of Orkney) (1865–1946): Began as a child actress, dancer, and artist's model, who attracted the attention of many painters and photographers (including Lewis Carroll). 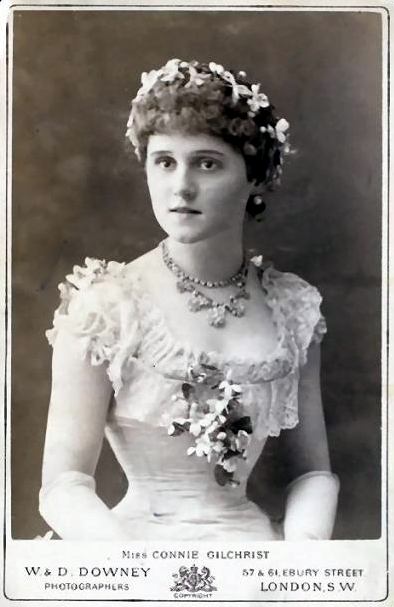 Her debut was in 1873 at Drury Lane. The following year, she played Harlequin in the Adelphi pantomime, Children in the Wood. In 1876 and 1877, she also played Harlequin. Gilchrist appeared on December 14, 1883, in Young Fra Diavolo--a matinee benefit performed by the Vaudeville Theatre.